The family of William H. Hudnut III today announced his death in Maryland, following a lengthy illness. Services are being planned for the former Indianapolis Mayor and former senior pastor at Second Presbyterian Church in Indianapolis. Hudnut was 84. “On behalf of our family, I would like to thank everyone for their outpouring of love and support during this difficult time. It was a real gift to Bill that he had an opportunity to hear how much he meant to family, friends, colleagues, and neighbors—and to the communities he served—through your notes, cards, letters, personal visits, and comments on his CaringBridge posts,” said his wife, Beverly Hudnut. “So many wonderful people helped us in so many ways these past couple of years— and we will be eternally grateful. In particular, I would like to thank our employers for their steadfast support in recent months. That includes Georgetown University and Bose Public Affairs Group (where Bill worked) and the Campaign Legal Center (my previous employer) and the Bipartisan Policy Center where I now work. “Our family is very grateful for the organizational support and longtime friendship of former colleagues John Ryan, Lesa Dietrick, and Dave Arland, as we finalize details for two public memorial services. One will be in Washington, D.C. and the other will be in Indianapolis,” said Beverly Hudnut. 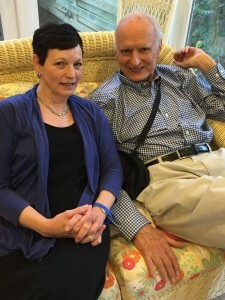 “My husband Bill loved writing updates for his CaringBridge website, under the site name ‘Mayor Bill Hudnut.’ He developed themes for his posts about, among other things, the importance of perseverance, the tender love of pets, and reflections about his time as Indianapolis Mayor and other life-changing moments. It meant a lot to him that readers found his words inspiring and wise. One cannot choose how one finishes the race, only how one runs it. I would not have chosen a long, slow slide into complete heart failure, but I tried to cope with it with “gaiety, courage and a quiet mind,” to borrow from my mother who in turn was quoting Robert Louis Stevenson. I have tried to lead a useful life. Of course, I’ve made mistakes. I’ve displayed some real shortcomings and caused some hurts along the way. I’m sorry. But overall, I look back with gratitude. I have been blessed in so many ways—by my loving wife Beverly for more than a quarter century; by my chances to move from a one-room schoolhouse in the cornfields of Illinois to graduate school in New York City; by living in America, and spending most of my professional career in Indianapolis; by having a beautiful cottage in the serenity of the Adirondack mountains; by manifold opportunities to lead a life of service and usefulness, as mayor, congressman, Presbyterian clergyman, academic, think tank fellow; and by the people in my life like doctors, staff, academics, co-workers, (certain!) media types, political allies (and adversaries! ), church members, fellow citizens who have worked with me and wished me well across the years. There’s no such thing as a self-made man or woman. We’re all indebted to others, a point I always tried to make whenever some thoughtful recognition like Hudnut Commons would come my way. Hudnut Commons was dedicated by Indianapolis Mayor Greg Ballard in January 2013 in honor of four-term Indianapolis Mayor William H. Hudnut III. Located at the corner of Maryland and Capitol Avenues in downtown Indianapolis, Hudnut Commons will soon feature a larger-than-life statue of Hudnut. The likeness of “Mayor Bill” is being finished now by artists Jeffrey H. Varilla and Anna Koh Varilla. The statue of former Indianapolis Mayor Bill Hudnut was dedicated on December 14, 2014. 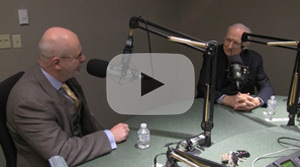 Mayor Bill Hudnut is interviewed on WFYI’s “No Limits” program by host John Krull. One America Financial Partner, Inc.
With finishing touches now being applied to a larger-than-life statue of former Indianapolis Mayor William H. Hudnut III, contributions are now being accepted to provide a perpetual maintenance fund for the bronze, seated likeness of the former Mayor that will soon overlook one of the city’s busiest corners. The statue, to be named “Mayor Bill,” will be owned by the Indianapolis Capital Improvement Board of Managers, which maintains the Hudnut Commons greenspace and underground parking garage on the northwest corner of Maryland Street and Capitol Avenue. A public dedication ceremony for the new statue is planned for 10:30AM on Sunday, December 14, at Hudnut Commons. “So much of what we take for granted today in Indianapolis grew from the seeds planted during the Hudnut years,” said Mayor Greg Ballard. “Our success as a sports center and convention city, and our reputation for hospitality and a clean downtown can each be attributed to Bill Hudnut’s years of service.” Mayor Ballard first announced the creation of Hudnut Commons in early 2013, with the hope that sufficient funds could be raised to place a bronze likeness of the former Mayor on the site. More than $250,000 in private contributions funded the seated bronze statue of the former Mayor. Contributions are still being accepted for the project, and those wanting to contribute can send a check to: Hudnut Commons Project, c/o Downtown Indy, 111 Monument Circle, Suite 1900, Indianapolis, Indiana, 46204. A Princeton University and Union Theological Seminar graduate, former Senior Pastor for the Second Presbyterian Church, and Congressman representing Indianapolis, Hudnut is also the longest serving Mayor of Indianapolis. After winning his first Mayoral bid in 1975, Hudnut was sworn in January 1, 1976 and was re-elected three times. During his 16 years as the City’s chief executive, dozens of major building projects were completed downtown, including the expansion of the Indiana Convention Center located across the street from Hudnut Commons. During the Hudnut years, more than $4 billion was committed to downtown Indianapolis redevelopment. The unveiling of Hudnut’s likeness in downtown Indy comes on a Sunday just before an Indianapolis Colts game, fitting for the Mayor who helped to attract the team to the city. During Hudnut’s time as Mayor, Indianapolis hosted the 1987 Pan Am Games, created the Indiana Sports Corporation, and made major investments to burnish the city’s image as an amateur sports capital. After leaving office in Indianapolis, Hudnut relocated to the Washington, D.C. area. He later was elected to the City Council of Chevy Chase, Maryland and also served as that town’s mayor. Hudnut has written five books on leadership and urban planning. He is Senior Fellow Emeritus at the Washington-based Urban Land Institute and today is an Assistant Professor at Georgetown University and Executive Director of the Georgetown’s School of Continuing Studies – Real Estate. Ratio Architects Principal William A. Browne led the effort to select the most appropriate sculptor for the project. “We first decided that it would be important to select an artist and determined that the best means of accomplishing this would be to engage with the Arts Council of Indianapolis,” explains Brown. An Arts Council jury selected Koh- Varilla Guild of Chicago and artists Jeff Varilla and Ana Koh Varilla from about two dozen submissions to create the Hudnut statue. “Their selection was based on their prior experience of completing projects in the public realm, their ability to complete a lifelike likeness of an individual, and their ability to handle texture and fabric in a very realistic manner. The piece that really caught the attention of the jury was a bas relief sculpture completed for Soldier Field in Chicago,” said Browne. The sculptors met with Mayor Bill in their Chicago studio to measure him so that the proportions would be as accurate as possible, as well as complete some additional photography. Hudnut decided that he preferred to be depicted sitting on a bench rather than standing, to communicate his connection to his constituents rather than being seen as a politician or statesman as represented by many sculptures of politicans. Koh-Varilla Guild has created monuments now placed throughout the U.S., South Korea, and England. In addition to the Soldier Field sculpture, the couple has also completed works now in the collection of the Vatican and commemorating such diverse subjects as Dr. Martin Luther King, Jr, Vice President Hubert Humphrey, and golfer Jack Nicklaus. The Hudnut bronze was cast in a New Mexico foundry earlier this fall and work is now underway to finish the granite display pedestal and complete finish work on the bronze tribute to “Mayor Bill” that will soon welcome visitors at Hudnut Commons. CHEVY CHASE, Md. – Bill Hudnut shouted from the basement of his home near Washington, D.C.
At 82, the former mayor of Indianapolis, the city’s longest-serving and probably most charismatic mayor, faces a long list of severe health problems. The worst is an advanced and terminal form of congestive heart failure, which is mitigated only by medicine that will eventually stop working. The diagnosis is grim. He knows that. But any thought that my visit would be a woeful affair disappeared the moment Hudnut took his last, slow step from his basement and into the kitchen of his home on a quiet street in this bustling D.C. suburb. The Hudnut smile — that big welcoming grin many of you have seen so many times — was there. The Hudnut spirit was there, too. You know what spirit I’m talking about, right? It was defined by the most memorable moments of the 16 years Hudnut spent as mayor: Like the time he put on a red, white and blue stocking hat and jumped on a snowplow during a blizzard that had paralyzed the city. Or when he dressed up as a leprechaun — all 6 foot 5 inches of him — and marched in the annual St. Patrick’s Day Parade. Or when he pushed the fiscally conservative city he led to dream big and build a football stadium before it even had a team. “It’s about optimism,” the minister-turned-politician said as we sat down for tea June 12. .
It’s also about thinking about the future, he added, and having a little fun. That’s the Hudnut spirit. The one that guides a house with an official “no moping and no whining” rule. The one that got him through the highs and lows of four terms as mayor, and that’s getting him through a health decline dotted by scary close calls, repeated hospitalizations, one brutal diagnosis after another, conversations about hospice care, and questions about what the coming months will bring. Despite all of that, an afternoon and evening spent with Hudnut, who left office in 1991, was at its core about optimism. Despite the excuses he could give for putting that trademark optimism away, he isn’t doing so. He didn’t dwell on his problems. Instead, he wanted to talk about politics and the politicians who are moving his old city forward, about sports and food and family. He’s on leave from Georgetown University but would like to work a bit more, to stay engaged. He hopes to be around long enough to see his youngest son, one he had late in life, graduate from college next spring. Hudnut has been in declining health for some time, but things went rapidly downhill at the end of 2014, just after he last visited Indianapolis to take part in the unveiling of a bronze statue of himself, a statue titled Mayor Bill. Once back in Maryland, he underwent 25 radiation treatments for throat cancer. The radiation appears to have helped, he said, but the heart disease is life-threatening and irreversible, and a malignant patch was recently found on his skin. Wearing khakis and a blue and white checkered shirt, Bill Hudnut laughed often, first at his home and then over gazpacho at a nearby French restaurant, and he asked probing questions about Indiana politics. Friends tell him he sounds the same as ever on the phone. His voice is indeed strong and his mind is sharp; he now relies on a cane or walker but looks so good it’s easy to forget he is sick. On good days, like this day, the only hint of imminent trouble is the black bag he carries with him, the one that holds a medical device that pumps life-saving medication through a tube into his heart. The hardest part about accepting Hudnut’s terminal heart condition is that smile. It’s still big and comes across the mayor’s face frequently. It shows that his “be cheerful” mantra isn’t just talk. Don’t question for a second, he said, whether he is still enjoying life. The last several years have seen a sustained re-embrace of Hudnut by his former city. Perhaps the Super Bowl that Indy hosted in 2012 was the catalyst for that, as so many people realized at that point that Hudnut’s work to lure the Colts and rebuild Downtown had paid off in a way once unthinkable. Or maybe it’s because in this era of destructive and empty politics many are looking back at political giants of the past — politicians who were courageous in policy and positive in spirit — with newfound appreciation. Or maybe it’s because he has never stopped professing his love for Indy, even long after leaving town. Earlier this year, Hudnut led an effort by the five surviving mayors of Indianapolis — current and former, all owners of solid legacies — to pen a joint letter defending the city during the controversy over the state’s religious freedom debate. Sen. Richard Lugar, one of the former mayors, said the effort was classic Hudnut — energetic, optimistic and focused on the city he loves. Hudnut smiled as we talked about the letter, which he said was inspired by a desire to stand up for a city he loves at a tough time. But it also showed that the four-term mayor and one-term congressman still understands politics. These days, between medical appointments, Hudnut is trying to connect with as many people as he can. He occasionally posts updates on his page on the CaringBridge website, and he writes thank-you notes to those who have reached out to him. He sends frequent emails to friends, and he’s following the race for mayor from 600 miles away. I asked him what advice he would give to the politician who will take over as mayor on Jan. 1, grabbing the reins of a city Hudnut helped rebuild, one with great strengths but also daunting challenges. By that, he meant that grand plans and big ideas will falter under the weight of a mayor who doesn’t get the potholes filled and the snow cleared from the streets. Running the city well, he said, gives mayors the capital to be visionary. He said the next mayor must also find a way to be an even bigger player in education, as nothing will shape the city’s future more than the quality of its schools. Meanwhile, he said, a good mayor needs to accept and learn from criticism and be as inclusive as possible. As mayor, Hudnut brought the NFL to town and sparked the Downtown renaissance that has defined Indianapolis for the past 30 years. But his legacy is actually about something bigger. With the force of his gregarious personality, he rallied the city and convinced its people to dream bigger than they had before. He said he saw his job as being both the city’s coach and its most animated cheerleader. One supporter wrote on Facebook that, “You showed us what was possible.” Mayor Greg Ballard said Hudnut masterfully found ways to rebuild Downtown “while never forgetting about the neighborhoods.” The national reputation he won, meanwhile, helped the city begin to play in the big leagues. Time and again, Hudnut apologized to me for “talking about the past,” even though I was the one guiding the conversation in that direction. That’s how our chats have always gone; I wasn’t in town during the Hudnut years and, so, I remain fascinated by the larger-than-life leader who left a transformational mark on a once-sleepy Midwestern community. Now, I’m equally fascinated by an octogenarian who has a mountain of health problems, who knows the end is near, yet who remains committed to enjoying life and boosting others and the city that he led. 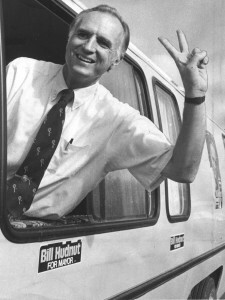 Former Indianapolis Mayor Bill Hudnut, a gregarious 6-foot-5 former pastor, was known in office as an approachable leader in constant communication with his constituents. So when some of his former deputies approached Hudnut for input on a statue in his honor for the newly renamed Hudnut Commons downtown, he wanted a similar vibe in statue form. The result is a slightly larger than life size, spitting image of Hudnut—seated with his legs crossed, sporting a tie but no blazer and looking eager to discuss big ideas for Indianapolis with anyone who stops by. 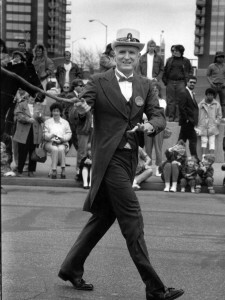 Hudnut, 82, was the city’s longest-serving mayor, presiding from 1976 to 1992. He built the Hoosier Dome without a tenant before landing the Colts from Baltimore, snagged the Pan Am Games and built the infrastructure for the city’s amateur-sports push, launched the transformation of the former downtown drainage ditch known as the Central Canal, and inspired the development of Circle Centre mall. The statue is based on a photo of Hudnut taken in Lockefield Gardens, a Depression-era public housing project that Hudnut helped clean up and redevelop. Hudnut said he’s “humbled, gratified and amazed” by current Mayor Greg Ballard’s efforts to champion Hudnut Commons. Ballard surprised him by renaming the former Capitol Commons in January 2013. “It was a magnanimous thing for him to do. Sometimes successors aren’t kindly disposed to their predecessors,” Hudnut said, in a not-so-veiled reference to his own successor, Steve Goldsmith, with whom he feuded for years. Private donors including Colts owner Jim Irsay, Pacers Sports & Entertainment, P.E. MacAllister and Hudnut’s own Second Presbyterian Church contributed $250,000 for the statue and its base. They plan to raise more to subsidize maintenance of the plaza, which will be owned and kept up by the city’s Capital Improvement Board. About two dozen artists bid for the work, and the Arts Council of Indianapolis selected Chicago artists Jeff Varilla, 65, and Anna Koh Varilla, 57. The husband-and-wife artists are known for their lifelike work and have created statues on display across the United States, South Korea, England and at the Vatican. It’s unusual for a statue to depict a politician in a seated pose, and for one to be shown smiling, said Anna Koh Varilla. But she said Hudnut “looks more natural” that way. The artists met with Hudnut, took his measurements, and photographed him at different angles. In Chicago, they created a clay version of the statue, which they took to a foundry in New Mexico. The process from there: Parts of the statue were cast in wax, then covered in ceramic material. The wax was burned out, leaving ceramic shell molds, which were filled with bronze. The pieces were welded together, and connection points sanded. Friends and former colleagues of Hudnut for years discussed ways to memorialize and pay tribute to the four-term mayor, said John Krauss, a deputy mayor under Hudnut and founding director of the Indiana University Public Policy Institute. Among others who led the effort were former OneAmerica CEO and Chairman Jerry Semler and Ratio Architects founding principal Bill Browne.